Do you ever have one of those weeks when the same item, theme, or person keeps popping up in different forms and places? This week I’m overwhelmed with seashells. It started when I saw a collection of decorative sea anemone pieces displayed at a design showroom. It may have been the deep blue wall paint that initially caught my eye, but the simple elegance of a seashell’s pattern always sticks with me. This same week, I was reading and enjoying the novel All the Light We Cannot See by Anthony Doerr. I truly enjoyed this novel, filled with metaphors, imagery, and even some suspense. One of the main characters is blind and has a strong connection to the shells of snails and other water based creatures. Throughout the book, she seeks and explores shells with her hands — the smooth bits, the rough sharp and bumpy bits, the patterns and swirls. Personally I am not a huge shell collector, but near our North Fork, Long Island home I can’t help grabbing the occasional whelk shell after it has washed up on the beach and is unoccupied. I particularly like whelk shells that are “imperfect” with portions worn away to expose an inner geometry. Why are we drawn to shells? Perhaps it’s because it’s evidence of an underwater world with its own set of order? Perhaps it’s because of our attraction to viewing approximations of the mathematical rationality of the golden ratio and spiral? Perhaps, for me, it’s because of the time I spent flipping through the coffee table book of Edward Weston photographs in my childhood home? After that first view of the anemones, shell furnishings, products and images keep popping into my life. The Hans Wegner Shell Chair. Wegner once said, "We must take care that everything doesn't get so dreadfully serious. We must play--but we must play seriously." (I’d like to adopt this as a guiding design principle). The Franco Albini Reclining Gala Chair. I adore this chair. It’s beautiful, and comfortable, has a hefty presence, and yet it offers a light sensibility. If anyone wants to buy me a very, very special birthday gift, this is it! Mirrors. Shell shaped. Covered in shells. Evoking shell shapes and patterns. Lighting. Literal shell shapes and others inspired by shells. Behind the scenes at interior project. Shell pod inspired lamp base. 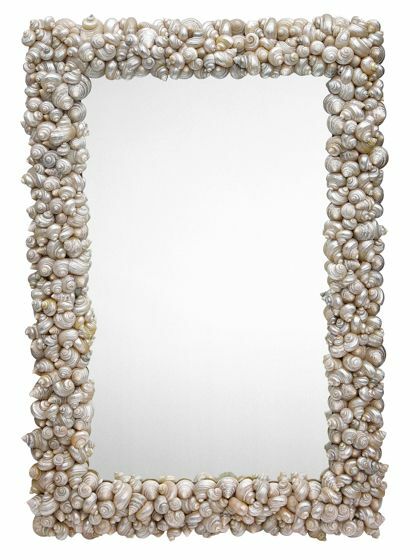 More furnishings, some fashion…everywhere I look, I see shells. Any seashell inspirations you see and want to share? Please comment. For more inspiration, check out my Pinterest page.